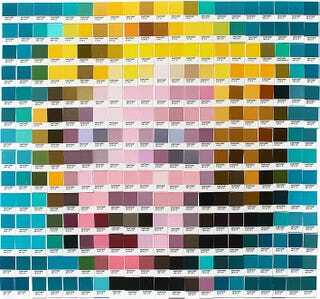 British artist Nick Smith recreates classic paintings from Vincent Van Gogh, Warhol, or Rene Magritte, using Pantone color chips. If you look at it up close—clicking on the expand button— you will only see the color chips, but if you step back—or zoom out—you'll see a pixel-art version of the original paintings. Nick Smith is an artist based London, England. He spent 7 years working as an Interior Designer, then resigned from job to spend more time creating art. Today he enjoys messing around with pervasive commercial and art imagery. You can follow Nick's work on Facebook, Twitter or his personal website. This is part of a series in which we are featuring interesting paintings. If you are a painter with high quality work, please drop me a line here.